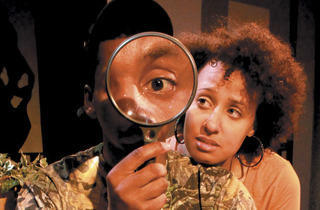 Keith Josef Adkins’s 2003 play about a black community missing its boys loses its central thread in MPAACT’s production. 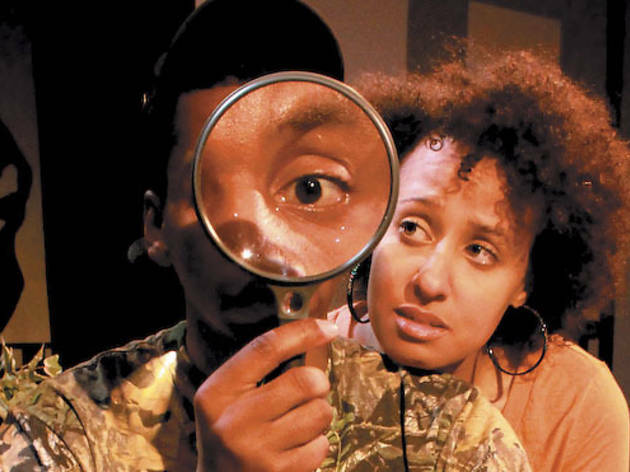 In this 2003 work, playwright Keith Josef Adkins constructs a semi-scientific fiction: All the black boys in the town of Sweet Home are gone, and only a brainy young traveler, Demus (Terry Francois), has the power to fulfill the citizens’ individual and collective dreams. Those dreams are ambiguous and creepy, and sometimes funny. One woman (Rhonda Preston) wants to mother him; another (Shariba Rivers, costumed in an exaggerated rump) wants to smother him with carnal love. A blustering leader (Earl Alphonso Fox) assigns Demus a daunting project. But distraction is everywhere—in the form of local vagrant Mr. Flowers (Sati Word) and a luminous young woman (Camille Cadenhead) who guesses some of Sweet Home’s evil secrets. That this is a political play is evident from Danjuma Gaskin’s set, which recalls the pointed silhouettes of Kara Walker. But despite Francois’s and Cadenhead’s finely understated performances, the message is muddled amid the high jinks, callbacks and female caricatures. The noise eclipses the story about African-American communities’ social fabric Adkins apparently means to tell.